College of Mechanical Engineering, Taiyuan University of Science and Technology, 66 Waliu Road, Taiyuan, Shanxi, 030024, China. 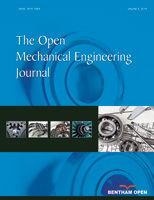 The theoretical solving of dynamic analysis on the enclosed gear-driven system is complicated, and only the surface vibration data can be tested in the experiment. In view of this, 3D modeling is carried out on a given secondary planet reducer to create a finite element model and perform finite element modal analysis. Via the modal test, the correctness of the simulation is verified. Also, ANSYS transient dynamics analysis (Full) is utilized and nonlinear factors (e.g., time-varying mesh stiffness, composite mesh error, gear backlash, and damping ratio etc.) are taken into account to make a comparison between dynamic simulation and bench test. Research results show that the first six natural frequencies in the finite element method (FEM) are quite approximate to test results, and the maximum error ratio is 8.12%, implying that the mode of vibration is identical. Moreover, the error is small between the results of the dynamic simulation and average acceleration of vibration in bench test, indicating that the vibration rules are basically consistent. Based on that, the next step is to acquire the vibration acceleration and gear ring meshing point’s stress variation curve at the input end and output end, which tally with the project’s actualities. Such a method helps to cover the test method’s shortages in analysis of internal vibration response.